To date, I have met only two people who actually “get” cloud computing and why it will be so transformational (Jeff Barr and Marc Mercuri). The term “cloud” is so overloaded as to become useless. What does Cloud Computing mean to you? Storing data in the “cloud”? Yawn, boring. Storing infrastructure in a data center? Sorry, we already do it. To me, one of the most compelling areas, which I have not seen in the media is…Software Agents. (warning, some blue-sky-what-if-out-of-the-box-dreaming ahead). Software agents exist today but most are at the corporate level, doing stuff on behalf of groups or large entities. E.g. a web crawling process that compiles an index of a set of websites is a software agent. Most hedge funds are executing almost 100% automated. These are examples of software agents at work. The only difference is these are not at a PERSONAL level. E.g. the Google Bot calculates an index for Google’s corporate use. The hedge fund executes trades for the entire fund. Imagine you had this type of computing but working solely on your behalf? Acting based entirely on YOUR personal preferences and within a certain set of entitlement based on rules YOU define. A “personal” software agent would work very differently. Let’s start with the obvious example of the travel agent. You give it some constraints; e.g. the date of your trip, the destination, the maximum you’re willing to pay, number of connections, preferred airline etc. The agent goes away and finds you the cheapest ticket. You don’t wait for this to happen, you get on with your life. The agent sends you an email with your itinerary. Ok, so far fairly boring and pretty much what you’d expect. A few days go by, the flight gets closer. The airline drops the price. With the right authorization, the agent would calculate the cancellation fee and send you an alert. Even go so far as to automatically buy you a cheaper ticket, cancelling the original. You get an SMS message stating your flight has changed. If you don’t reply, the agent will physically call you and leave you a voice mail using Text to Speech to make sure you’re aware of the new arrangements. A day before your trip you’ll be sent a weather report advising you of clothes to pack. Let’s say the agent has access to your social network and you’re traveling to a city with friends in the first-level of your network. Your buddy Fred’s birthday is two weeks away. The agent could pull up Fred’s recent Tweets and prompts you to buy Fred a present, linking you over to Amazon and offering a list of recommendations. One click later, you’ve purchased your friend a gift and it’s being shipped to his home. Now the agent will go and Private Message Fred on Twitter, letting him know you’ll be in town. Amazon emails the software agent to let them know the package is on the way. Now the agent is acting as a message aggregator, merging all possible communication about this trip into a single stream. You’d get it all through instant alerts, consolidated email and RSS. You arrive and a hotel/car is waiting, again negotiated through the agent so you get the best possible deal. Whilst on the actual trip; You check in by swiping a bar code that appears on your phone. Your corporate expense system is notified and the expense report process is begun. The agent runs in the cloud, tracking your flight, notifying you of any potential issues. There’s an empty seat in First Class? Let’s see if we can upgrade. How about an in-flight movie? Let’s stream it from your DVR back home but streaming doesn’t work at 35,000 feet which is why the agent went ahead and loaded last night’s TV recordings onto your phone (where the agent’s client-application is running). It could also work within your social network, notifying Fred if your flight’s delayed. The agent is smart enough to learn your habits. It’s 3PM? time for a Starbucks. We just landed so you’ll get a low-level google map of the airport, and compass on your mobile device pointing you to the nearest coffee shop. Another expense added to the report. If you were to create a startup with the goal of offering personalized software agents you’d need to really focus a lot of time on the expected capacity of the site. It’s very tough to get this type of planning right. One of the great strengths of Cloud computing is the notion of “Elastic” infrastructure; scalability on demand. With this type of infrastructure, the only thing preventing this service is access to data (almost everything I mentioned so far is available today through some public API) and privacy. A software agent to manage personal medical insurance claims for either an individual or a household. It’s tremendously time consuming and difficult to keep track of all medical claims submitted by providers, in network, out of network, managing your flexible spending account, presciptions (generic vs non-generic), keeping track of refills, getting notified of potential drug contraindications including relative contraindications or drug interactions. A long-running agent to help orphans locate their parents (or vice versa). Again, privacy is a big issue here. Las Vegas: Consider that a large portion of fraud prevention centers around digging through private databases to look for correlations. E.g. “John Smith” who just walked into my casino once took a book out from the library directly after a known Black Jack cheat called “Fast Johnny” returned it. What are the chances? Oh John Smith once co-signed a lease with the brother of a known loan shark. Maybe it’s worth pointing an eye in the sky at his table? Hopefully you’re not working in any of these jobs today as ultimately I see them as being replaced by automated multi-disciplinary agents. Cloud computing and the notion of Elastic Scalability is a definite enabler. 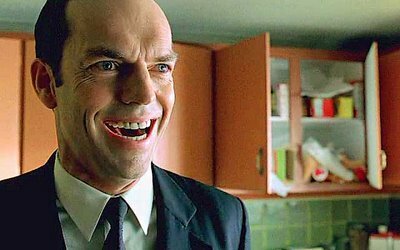 It’s doubtful we’ll ever have a personal “Agent Smith” but given that most of the technology to do everything I’ve listed in this blog is already here it’s only a matter of time before someone ties it all together.